Last weekend, Erika and I “ran” a 5K “event” run here in Nashville. 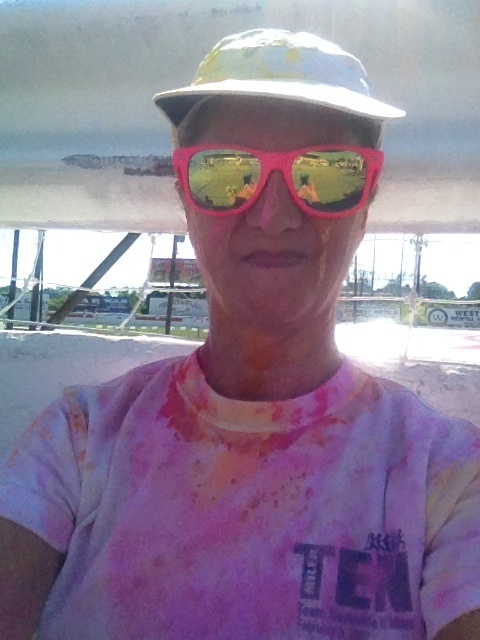 These large, novelty runs, like the Color Run, the Electric Run and Color Me Rad have gotten popular recently, and I thought I’d check one out so I could share the experience with my dedicated readers on My Decade of Running. Since I started My Decade of Running, I’ve tried a few new experiences such as Nashville Running Tours’ Historic Downtown Nashville Tour, which was wonderful and I loved every second of it. Just thinking about it makes me smile. Last weekend’s “run”? Not so much. The only good thing to come from the experience is that Erika and I will be able to laugh about it for years to come. We read all the instructions on the event website and wore white – so you can see all the color that gets thrown at you. We put stuff in our hair so we’d be able to wash the color out. And we know how to run. We thought we were prepared. To begin with, the event was held at the Tennessee State Fairgrounds in Nashville. I know it’s the last thing my Nashville friends want to hear from their carpet-bagging Yankee friend, but the Tennessee State Fairgrounds, (especially the racetrack area) is the armpit of Nashville. I hadn’t been there since back in the day when Fan Fair (now the CMA Music Fest) took place out there. Not much has changed. When Erika and I arrived at the Fairgrounds, it was already hot. It’s June in Nashville, after all. And there was no shade. While Erika was finding a parking spot, we quickly assessed the crowd. People were wearing fairy-wings with their white tutus. One guy (who might want to install a full-length mirror) wore a white full-length skin-tight bodysuit. 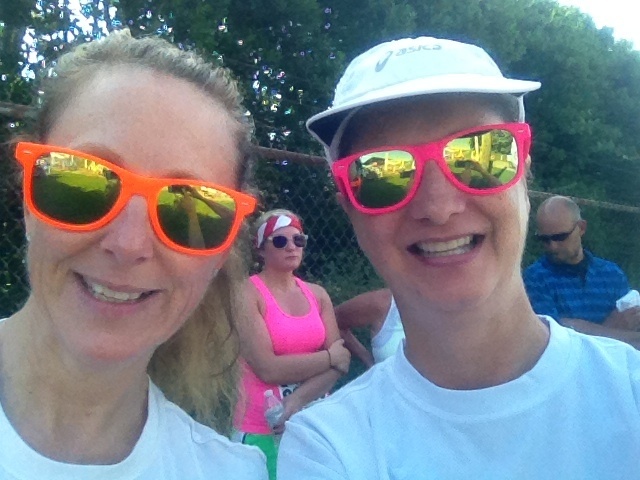 Everyone but us wore official run merchandise – tutus, t-shirts, head bands, brightly colored knee socks, and really cute white tanks. I had to force myself not to look at the cute white tanks so I wouldn’t buy one due to my lack of willpower when it comes to cute running clothes. Not that I’m judging the other participants. I own my very own red running tutu – perfect for 4th of July runs, Christmas runs, and the East Nashville Tomato 5K (or so I told Richard to justify that particular purchase). I just hate being under-dressed for an event, and we were very under-dressed. Wisely, we decided to line up in what would ordinarily be classified as the “elite” portion of the Start Line. After some announcements and crowd motivation, the lead car took off – with the lead runner close behind. I’m not sure whether no one informed the lead runner this “race” wasn’t timed, or if he just got lost on his way to another event, but he was giving it all he had. He looked like Usain Bolt leading a pack of athletically-challenged children. I hope he got some kind of award. If not, he might be very upset right now. Before the “race”, we talked to a sweet, young woman in the bathroom line who suggested we cover our nose and mouth with our hands while passing through the color stations, so we didn’t breathe in the advertised “perfectly safe corn starch with coloring.” That was the best advice we got all morning. Our first color station was yellow. You have to wonder about the volunteers for an event like this. What kind of person is willing to get up early on a Sunday to throw stuff at people? Occasionally, perhaps people with unresolved anger issues? That might explain the last guy at the yellow color station. Mr. Unresolved whipped a handful of yellow powder at my face with the fury of someone who didn’t have a whole lot of friends growing up. The cute event sunglasses did nothing to protect my eyes from the assault of his pent-up frustration. Unfortunately for Erika, I had no one but her to whine to. “The yellow is in my eyes! I can’t see! !” When I finally took off the sunglasses, I realized it was no wonder I couldn’t see – the lenses were completely covered with yellow powder. After wiping off my sunglasses on the back of my white running skirt, my vision was miraculously restored. The next color station was purple. I love purple. Half my wardrobe is purple. Surely, purple would be good – much better than yellow. So I took my time passing through the purple color station, my eyes squinted almost shut to keep the purple powder out. But the purple color station was manned by a couple of young girls who may have been working off summer school through volunteerism and picked this volunteer gig over picking up trash along a highway – they weren’t really into it. Now my formerly white ensemble featured a whole lot of yellow and a few little streaks of purple. Then came a water spray station consisting of two young girls (classmates of the girls from the purple color station). One listlessly announced, “This is water” while the second girl worked the sprayer. Maybe the sprayer girl was scared of hurting someone, because she hosed us so tentatively that I couldn’t feel any water (although I could have used a good soaking). Then there was an uneventful orange station and a pink station where I heard one of the volunteers yell, “Let’s all gang up on someone” right before they descended on me like angry pink powder-throwing badgers. By then, I didn’t even care. Pink and orange powder combined with the sweat running down my legs to form a disgusting mass that resembled a rash caused by cheap self-tanner. Finally, Erika and I emerged from the color bombardment and made it onto the Nashville Fairgrounds speedway. This was the most fascinating 2 minutes of the “race” for me. I’d never been on a racetrack before and was really amazed by how steep it is. It felt like I was running at a 45-degree angle (according to Wikipedia, it’s actually an 18-degree angle). I pondered why the race cars don’t tip over. Then we finally crossed the finish line, which was when I realized that Erika and I were elites at this event. Only a few people had crossed the finish line before us, probably because only a few other participants actually attempted to run. It’s kind of lonely after the finish line until other people finish, too. We grabbed water and tried to find shade while we checked out the scene. A talkative woman on the Main Stage managed to work the few finishers into a frenzy of throwing colored-powder into the air and at each other. Finally, we called it a morning and headed for Erika’s car, where we attempted to clean ourselves up before the drive home. My post-run shower felt amazing, although rigorous scrubbing didn’t remove all the dye. When I cleaned my ears, I panicked to see a bright-yellow Q-tip, until I realized it was caused by yellow powder, not earwax. I quickly texted Erika so she wouldn’t have the same moment of panic. She advised me to check my nose, too. Sure enough, it was pink up there. The reason I’m not divulging the exact name of this event is because, although it was clearly not a great fit for me, it looked like a lot of the people in the crowd had a great time. I’m sure it was fun for people half my age who don’t mind being pelted in the eyes with bright yellow powder. It might even be a great way for a young person to discover running, or if not actual running, they might realize they enjoy getting outside and walking 3.1 miles. If so, it’s worth it. There have been some stories on the internet recently about “event” races that turn out to be misleading at best and scams at worst (search “Electric Foam 5K and you’ll see what I’m talking about). This was NOT one of those events. It’s a completely legit event that many participants enjoyed – it’s just that I wasn’t one of them. And I would hate to discourage someone from participating because this one old lady didn’t have a super-fun time. After all, the target audience is people half my age, most of whom are a lot more fun than me and don’t do their own laundry. Bummer about the run. Yours are reasons why I am traditionalist when it comes to road races. Glad you liked the Nashville History Tour.